Machine learning—programming computers to learn from data—has spread across scientific disciplines, media, entertainment, and government. Medical research, autonomous vehicles, credit transaction processing, computer gaming, recommendation systems, finance, surveillance, and robotics use machine learning. Machine learning devices (sometimes understood as scientific models, sometimes as operational algorithms) anchor the field of data science. They have also become mundane mechanisms deeply embedded in a variety of systems and gadgets. In contexts from the everyday to the esoteric, machine learning is said to transform the nature of knowledge. In this book, Adrian Mackenzie investigates whether machine learning also transforms the practice of critical thinking. Mackenzie focuses on machine learners—either humans and machines or human-machine relations—situated among settings, data, and devices. The settings range from fMRI to Facebook; the data anything from cat images to DNA sequences; the devices include neural networks, support vector machines, and decision trees. He examines specific learning algorithms—writing code and writing about code—and develops an archaeology of operations that, following Foucault, views machine learning as a form of knowledge production and a strategy of power. Exploring layers of abstraction, data infrastructures, coding practices, diagrams, mathematical formalisms, and the social organization of machine learning, Mackenzie traces the mostly invisible architecture of one of the central zones of contemporary technological cultures. Mackenzie’s account of machine learning locates places in which a sense of agency can take root. 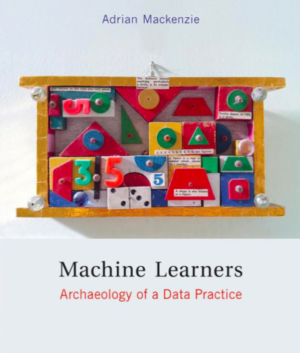 His archaeology of the operational formation of machine learning does not unearth the footprint of a strategic monolith but reveals the local tributaries of force that feed into the generalization and plurality of the field.